Team G Square: The Prefect Road Trip - " Team G Square"
On the evening of December 05 2008, I was in a hurry to end my day’s work as I had to join my friends for a road trip. Little did I know that this would turn out to be a life changing road trip. My friends and brother waited eagerly at home so that we could kick start our journey. As usual we borrowed our sister’s Indica (car) for our trip and with the entire luggage packed and stuffed into the car, headed towards Goa. We drove on the NH-4 up to Tumkur and then took a turn towards Shimoga. It was time for dinner and so we stopped by at a Dhaba (highway eat-out) for a sumptuous meal. Heading on, we kept driving until midnight and decided to halt when we were about 15 km ahead of Shimoga (towards Honnavar). We had a good night’s sleep in the car and the next morning we woke up and found a nice spot to finish our morning ablutions and continued driving towards Goa. We had Jog falls for breakfast and Karwar for lunch. Then cruising along the west coast we reached Madgoan/Margoa, headed towards our family temple where we had booked our stay for the next two days. The following morning kept everyone busy but me, in marriage preparations. I had the privilege of resting as I was the lucky (read it as not-so-lucky) bride-groom. I spent the day’s end by the riverside dreaming about married life. The D-day arrived atlast! The marriage was a very simple affair and went on smoothly. We finished our lunch at the temple and headed towards Margoa railway station. Thanking them for being there, we bid adieu to our friends and family who boarded trains to return to their homes leaving the car to us. This was only the beginning of our new journey. Me and my wife headed towards Colva beach and spent a good amount of time enjoying the cool breeze. We later drove towards Panjim where we booked a room at a lodge that had a riverside view and spent the night calmly just like the river there. The next morning, we explored various forts and beaches around and did some parasailing over sea and spotted some dolphins far away in the sea. After the water sport, we rested for a while and moved on. On our way, we sighted a board directing towards Arvalem caves and falls. Feeling very excited, we inquired a few people and reached the caves and falls. 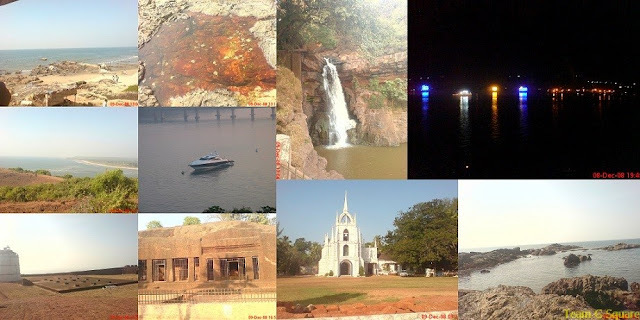 The evening was spent enjoying the falls and late evening we headed towards Karwar. At Karwar, we halted at a fairly good lodge to spend the night. Making inquiries the next morning at the lodge reception about places of interest nearby, we got to know of great places such as Yana, Mirjan fort, Gokarna and so on. We headed toward Gokarna and offered our prayers and moved on to the beach. Without wasting much time we decided to explore Yana since we had heard a lot about this place before. We walked by foot to enjoy the bliss of the Western Ghats during winter. With no breakfast our 12km trek to Yana was wonderful and an unforgettable one. We reached a village on Sirsi-Kumta highway and stopped by at a small shop and ate everything they offered us. So hungry we were! From here, we decided to head towards Unchalli waterfalls near Sirsi. We reached the crossing where we had to deviate towards the waterfall at around 5pm and had to travel 20km more to reach the waterfall. We were now in a dilemma whether to proceed or not as it would turn dark by the time we reached. We decided to head towards the falls and were greeted by a swiftly moving deer which in no time vanished into the woods, thus giving us a signal of the wildlife activity here. Finally, we reached the point from where the trek to the falls began. The Sun had already set and darkness gradually started to engulf the area. With a lot of courage, we walked towards the falls. After walking for about half a kilometer, we realized it was too dark to proceed as nothing was visible. We safely returned to our vehicle and headed to our friend’s house near Honnavar, where we had our night’s meal and crashed onto our beds. After a sumptuous breakfast the next morning, we were at the jetty point waiting for the jetty to take us to an interesting place revealed by our friend, the Mavina Kurve Island. Mavina Kurve is a small and serene Island nestled in the River Sharvathi. The jetty ride was quite pleasant and rewarding. Hereon we moved towards Mirjan fort, which was under restoration by the ASI (Archeological Survey of India) during our visit. We had no idea about its history at that time. The guard there told us not to take photos using a camera though he allowed mobiles to do the same. After a good stroll inside the fort, we drove towards Karikana Parameshwari temple located atop a hill close by to Honnavar from where we had a good view of the Arabian Sea, Sharvathi River and the surrounding hills. Now it was time to head towards the Mighty Jog, considered to be the highest plunge waterfalls of India. On the way we stopped at a view point to get a wonderful view of the Sharvathi River. We reached Jog, and as the water trickled down the rocky hills, we only wondered about how wonderful it would be during the monsoons. We were curious to we see the spot where a scene for the movie “Mungaru Male” was shot. Later, while driving towards Sagar, a board directing towards Ikkeri caught our attention and in no time we were in front of a huge and magnificent temple built by the Keladi kings during the 17th Century. We were quite surprised as we were not aware of such a temple. It was late evening and we reached Heggodu, a village that houses a famous cultural organization called NINASAM, started by K V Subbanna (a famous Kannada artiste). We were quite hungry as we had forgotten to have our lunch and went in search of the canteen here. The hot Idlis with chutney served here were the best we have had till date. We inquired about the route towards Mangalore and were directed to reach Thirtahalli first. Driving on the winding roads in the dark was a pleasure. People at Thirtahalli recommended us to head on to Sringeri for halt, where we crashed for the night. 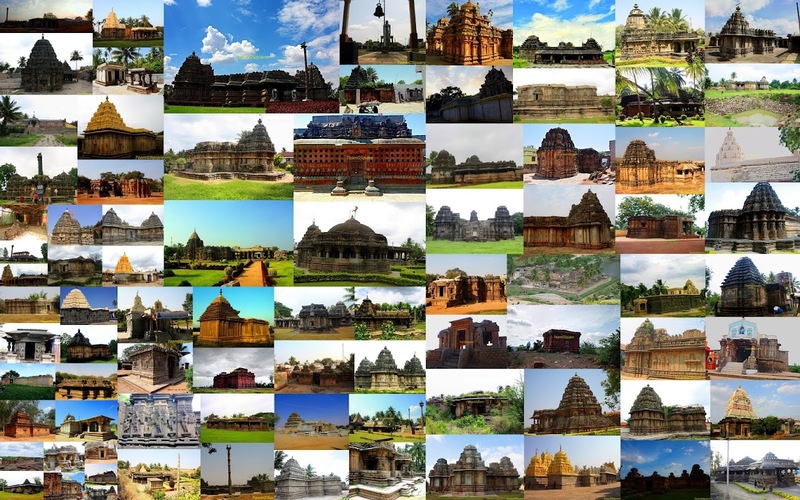 We woke up little late in the morning and moved towards the temple of Sringeri. At South Kanara border, we turned towards Kudremukh and reached the Kudremukh Nature camp. Unfortunately we were not let into the camp as we failed to get a prior permit. He suggested we visit the Lakkya dam and Hanumangundi waterfalls. On reaching the Dam site, we realized the visiting hours were in the evening. Not wasting much time we reached Hanumangundi falls. After paying the required fee, we had to walk down to view the falls. The falls looked majestic and seemed like it awaited for its first visitor of the day. We spent a lot of time here enjoying and exploring the surroundings until a noisy crowd walked down. Our ascent was tiring. We decided to end our exploration here and reached home for lunch. Personally, this was the perfect road trip I had ever been on. To have started this road trip as a bachelor with friends and ended the trip with my friend for life (my wife), having traveled in a borrowed car through unfamiliar routes, without much preparation or planning was an adventure by itself and a once in a life time experience. It was undoubtedly an amazing road trip, but most importantly it opened a new avenue in our lives. 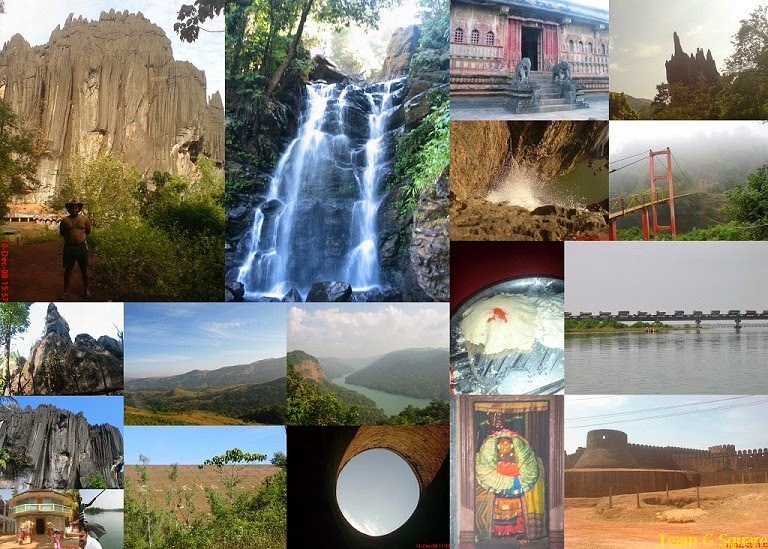 “Team G Square” was born with a desire to explore and discover every inch of Karnataka and beyond. We only wish that this journey never ends…..
What an incredible adventure!! I have to admit that I'm just a bit envious!! So much beauty and history! A wonderful post and fantastic captures!! Thanks for sharing -- a post like this is the next best thing to being there myself!! Great to read your post,Nice photos.All the Best . WOW! Simply beautiful. The last para was really touching. This is one road trip, I wish, remains as beautiful and fresh as it was then, for all the years to come. All the best for the contest, Dhiraj. This does indeed sound like a perfect road trip. Good luck to your contest, and sounds like a perfect road trip! Amazing road trip! So that's how Team G Square was born! Nice post. Looks like it was written just like the trip happened - unplanned and I enjoyed reading it. Liked the 'we spent the night just as calmly as the river nearby' part. I hope the journey continues for long. Quite an amazing road trip. Thanks for sharing. Best wishes for the contest! It was a long and thrilling journey with a lot of food for the eyes and the mind. In addition to the gripping text, the pictures are quite fascinating.